Protects cables and hoses up to 1.325″ outside diameter - This makes the Guard Dog® 5 Channel ideal for use in audio visual applications, or entertainment venues and events. Interlocking Design - The Dog Bone connectors mean that any number of units can be attached end-on-end to achieve almost any length of cable protection required. Hinged Lid With Reinforcements - The lid is hinged across one side allowing cables to be placed into the contained channels with ease. 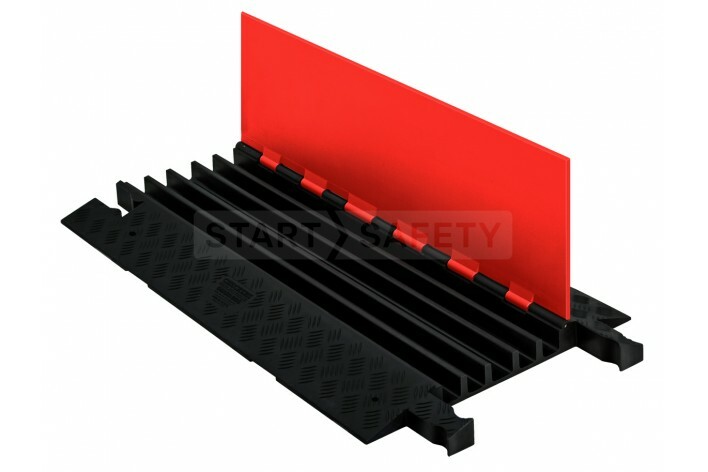 This makes deployment much faster than other less advanced cable protection ramps. Suitable for use all year round - The Guard Dog® system is made from ultra-tough polyurethane, and is designed to stand up to extended use in almost any climate and environment. Patented 5-bar tread surface for maximum traction - More traction for improved pedestrian safety. Mounting holes included - The Guard Dog® system incorporates four mounting points for temporary mounting on surfaces. Designed For Frequent Use - The high strength and ergonomic design of the Guard Dog® make it ideal for mobile entertainment venues, such as fair grounds, music festivals and sporting events. It is quick to deploy and just as quick to pack down after.